Of course you know that a groundhog has no relation to a pig, but did you know that a groundhog is also called a woodchuck? So it would be entirely appropriate to say, “How much wood would a woodchuck chuck if a woodchuck could chuck wood?” on Groundhog Day! 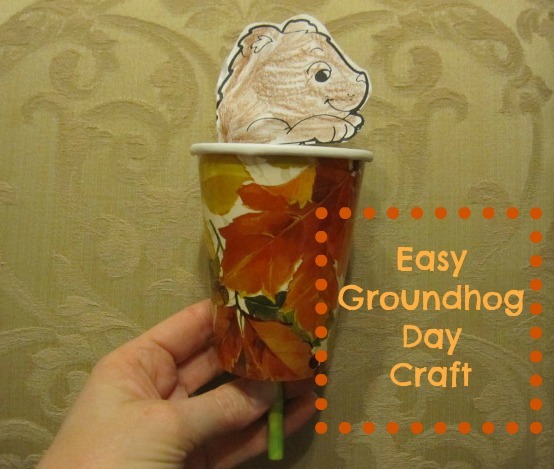 Emmy and I put together an easy craft for Groundhog Day instead. Watch how to make it in the video below. Lily is videotaping us, and I apologize for the shakiness! Emmy and I also sing a little Groundhog song for you. The words are below. Then six more weeks of winter, OH NO! Linked to the Pin It Party! I am sorry I haven’t been over to your blog much lately, but it doesn’t seem to update in my list! Anyway, try to do better from now on. And I’ll remember Feb 2nd! That is so cute! I really miss when the kids were little. I love Groundhog Day. I love mid-winter towards the end of winter. It’s a hopeful time! And this is cute. Is Abby wearing penguins on her shirt? tamaralikecamera recently posted…Wherever I May Roam. haha, that’s weird. And also unlike me to make name mistakes! It was before breakfast. Sorry!!! Thank you, Janine! I will definitely stop by and pin it!